The first annual UCLA Alumni Regatta was sailed in Marina Del Rey on Sunday May 24th. Recent and older alumni raced along with current team members in a buzzards bash format. We fielded 18 boats that sailed in 2 fleet racing divisions to determine the team racing teams for the afternoon. 8 races total were finished by the 18 boats in the morning we took a lunch/free sail break to figure our team racing teams and racing resumed finishing one round robin with 6 teams. Barbeque was provided all day and Alums met and mingled with current and other past team members. 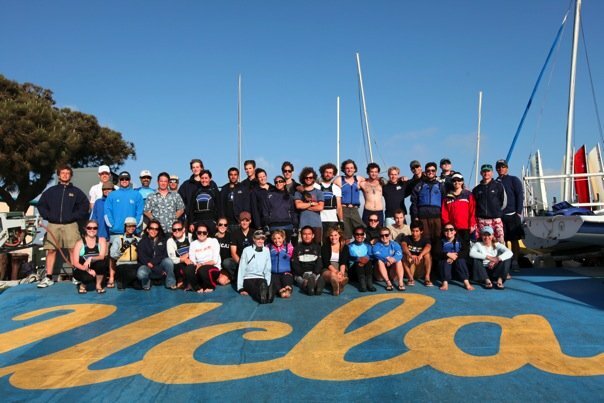 Friends of the UCLA Sailing Team (FOUST), the alumni group, conducted its first meeting and voted on officers President: Sam Wheeler, Vice President: Lyzz Schwegler, Treasurer: Blaize Wallace, Secretary: Stephanie Spilker, Team Liason: Kelly Kephart. This event was a great success and we plan to continue the tradition annually. Thank you so much to the Alumni who came out to participate and donated their time and money to help the team. Special thanks to the current team members who helped run the regatta and sailed with Alums.